The month of January has so much to offer, from tropical migrants in the equatorial zones to visitors from the poles in our more temperate climes. If you didn’t get to explore this weekend, start planning for the next. Between work and NFL playoffs, I didn’t get out much. Fortunately, I had multitudinous murders of American Crows to appreciate; Rochester is reputed to have more crows than people. A pelagic trip yesterday put Corey in a quandary over what to choose as his Best Bird of the Weekend. Should he pick an alcid? One of the awesome gull species the folks on the boat spotted? Northern Gannets? In the end he chose Dovekies, of which there were many, though Carrie, who was also on the boat, would probably prefer they be called Little Auks. What’s not to like about a tiny alcid? Even better was that these were the first Corey had seen since 2012. African Wild Dogs. Okay, not a bird, so if I had to pick a bird it would be… African Wild Dogs. Sorry, some weekends the birds can’t compete. Tried for Snow Buntings but no luck. Almost as good was a small flock of Horned Larks, a solitary Northern Harrier,a couple of Rough-legged Hawks and a late Great Blue Heron (perhaps suicidal in this frozen Ontario landscape). Best, because they were almost impossible to pick out against the lark-coloured fields, were the Horned Larks. Read about them and more by clicking on my name above. We are slowly moving from ten acres on a tidal creek to a very small cottage in a senior community. Yesterday I doubled the new yard list by adding gold finch to the chickadee I saw last week. So gold finch was my bird of the weekend. The yard list in the house we are leaving has 178 birds. I will have to work hard to get 30 probably at the new place. Definitely the Calliope Hummingbird- pretty good bird for North Carolina! 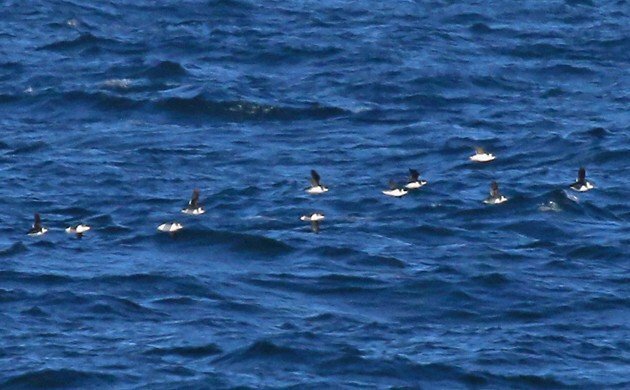 I wish I could say that mine was a Dovekie but the Little Auk does not make it to Monteverde, Costa Rica. Windy weather meant very poor birding (and no quetzal). I choose Black Guan for my best bird. A pair of Bald Eagles on a treetop at the edge of a cliff overlooking the Strait of Juan de Fuca on the Olympic Peninsula. I’ve often seen one eagle there, so seeing two sitting side by side was special! Two Canyon Wrens vocalizing and flying about the steep canyon walls of the Owens Gorge in Eastern California. The singing American Dippers were a treat, too! Banded Honeyeaters near Broome…earlier on our year list than other years! Short-eared Owls. Nothing better than watching Short-eared Owls flying around “barking” at each other. Best bird of the weekend was a American Tree Sparrow. Not amazing but pretty good considering my binoculars are in for repair and I’m having to make due – certainly not a great way to start off the year! Nothing particularly outstanding (a no-time-for-birding weekend, sadly), but it was nice to spot a Red-tailed Hawk checking out the locals, high up in a bare tree on the campus of Temple University in Philadelphia. Let’s hear it for urban raptors! Two little gangs of alpine accentors in the Catalonian Pyrenees. Can never see too many prunellids!